Come one, come all to the largest art show fundraiser in Sun Lakes – Art at the Lakes. You’ve read about it for months. 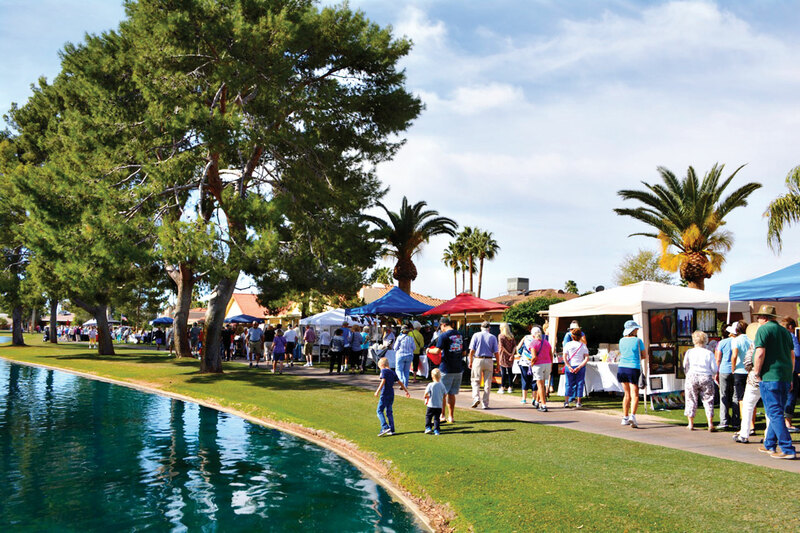 Now is your chance to enjoy the Sun Lakes art scene around a beautiful lake. The show is March 3 from 9:00 a.m. to 2:00 p.m. with a rain date of March 10. You’ll see 85 artists offering a wide variety of painting mediums, jewelry, wood items, stained glass, pottery, gourd art, fiber art, photography, books written by Sun Lakers and much more. There will also be a raffle again this year worth approximately $5,000 with all money going to the Sun Lakes firefighters and medics community relief fund (SLERF). They help us all year, and now they need our help to raise funds to assist community members in need. Our firefighters and medics will be selling donuts and coffee in the morning. They will be grilling hotdogs and hamburgers in the afternoon and including chips and drinks with your meal in the afternoon. The Dry Heat Pickers will once again be entertaining guests with great music. They have a new guest vocalist for your listening pleasure this year. Please mark your calendars and join us for a good time. Admission is free. Hope to see you there.